How good are German DDs in ranked? So, my plan for ranked this season, the first season I'll be devoting time to it, is to wait until I get the special German commander. Once I do that, I'll use my 19 point American and German BB commanders to stuff him full of experience till he explodes, then it's off to the races. I was planning on using the improved vigilance skill and hydro to screen for torps and contest caps, using the Z-39, Z-23, and Z-52 as my primary ships. My question is, is that even a good idea? I've barely played ranked in the past, and I don't know what the current meta for it is. And if it is a good idea, what other captain skills would be good, besides the absolute most takes like last stand and concealment. I played Z-52 for the most part this ranked season. I played like crapfor part of it due to recovering from a surgery, but still ranked out with a 60%WR. My understanding of Z-52 and the meta is this. You are going to have a more difficult time on open maps like TotD. I wanted to stay near congested caps like C caps on Hotspot, Moutain Range, and A cap on Warrior's Path, though you can make most of WP work for you. My actions depended on MMing. If there were two or more radars I generally avoided driving into the fish barrel where you get picked apart. Instead I would try to head to a position where I could spot a radar CA, maybe torp cap, and if my team has radar, smoke up and farm the enemy DD trying to cap. It was important to remain outside radar range as Zed tends to take a lot of burst damage. Use your gun and torp circles to help you gauge that. Though I usually prefer to drop RPF for SI and EL to swap rapidly for AP shots. An area I was experimenting with was my usual PM2 or SGM2. The issue was the radar YY. Smoking and hydroing them was death. Since I wasnt stopping often I found SGM2 better for evading fire when I was radar detected. If I was in cover I found PM2 was not needed. Some times I was able to better evade slow juking, but which is consistently better I have not decided. Zed I found was just better at holding terrain than YY. The YY radar is powerful, but its down vastly longer than its up. The reverse is true for Zed. Location: Minnetonka, Minnesota for a while. I like the tier 8 but haven't played much ranked (A long, frustrating, seemingly senseless grind, is not really appealing) so don't know about the tier 10. Location: In the bathroom, where else. Almost all ships are usable in ranked. a lot of it comes down to the player using it. A big advantage the german dds have is its hydro and fast torpedo reload. As a DD in ranked you don't want to give away your position. so don't get shotting your guns unless you run into an enemy DD. try to spot and smoke for your allies. as well as use your torpedoes to control the flow of an area. you don't need to shot both sets of torpedoes at one time, unless you are for sure you are going to hit something good if you do. as a german DD you can basically shot a set of torpedoes every 45 seconds. basically your torps load at the start only shot 1 set. then wait 45 sec and then shot the 2nd set. Doing makes the enemy have to void torpedoes more often forcing them to maneuver where they might not want to. as well as if you do hit a crapwith a torpedo and flood them. 45 sec later your other set might hit and flood as well. forcing that player to have to use DCP when ever its not on cd. Kagero - great stealth, torpedo reload, great torp damage. best for spotting the enemy and controlling the flow of a battle. Akiz - high damage torps, great destroyer killer. best for contesting an area with the help of a cruiser. ognvoi - great reload on torps 2 sec slower reload then german but 1 extra torpedo per tube, great guns. best for smoking allies and spotting the enemy. can control an area with torpedoes and hold its own 1v1 vs any other dd minus the akiz unless at ranges over 10km. z23 - hydro, fast reloading torps, great AP guns. best for spotting for allies while controlling an area with torps. can contest a cap with the use of hydro and smoke if needed. save smoke for escapes or when contesting a cap vs another dd in hydro range. Still use smoke on an ally if needed. Usualy when they are getting focused and needs an escape route. I didn't feel like covering the premiums. but that is a general idea how each dd can be uses well in ranked. when I mention controlling the flow of battle its about forcing the enemy to turn. or move out from behind an island. forcing an enemy to turn broadside to your team to dodge torps a lot of times can be worth more then hitting 1 torpedo on an enemy. so if your on the broadside of the enemy fleet flanking. and they are bow in to your allies. launch 1 set of torps with the wide option. that way more enemy will have to turn to dodge torpedoes making them all go broadside. Your skills past the first ten points are much different than what I was planning. At tier one, in random I go with PT over PM much of the time, but with the lower ship count in ranked, it loses enough value to make me choose PM. Tier two is one I'm on the fence about. With their massive health pools, German DDs get deleted instantly so much less that I do like AR, but the improved jack on the special commander leaves it up in the air for me. But at tier three, I don't think I'll take BFT. I much prefer the 150s on the 23, so I was going to get the improved vigilance to better screen torpedoes for myself and my team. And again at tier four, I'm torn. RPF would help me pick or avoid fights so much easier, but if I chose IFHE I can damage BBs more efficiently. Or I could not get a tier four, and get torpedo reload and EL instead. What's your opinion on these choices? The biggest issue with the Z-23 in ranked is that you're going to be facing a lot of Lo Yangs, and they out-gimmick you by a comfortable margin. Without that hydro advantage, the Z just doesn't perform well enough in any other area to justify choosing it over the Lo Yang, or Benson/Akizuki if you don't own LY. The stats so far bear this out, as the Z-23 is currently sitting at a 49.26% win rate, good for 7th among T8 DDs. That's not to say that you couldn't do well in the Z-23--I ran through the T8 ranks in Kiev, which holds a win rate only half a point higher. That said, a lot of people misplay Kiev horribly, and I don't. I don't currently have Z-52, so I can't comment directly on how well she stacks up at R10+. Based on what I've seen & heard from other ranked vets, it's a solid choice at DD, with radar Yueyang being slightly preferred. A word of caution, though--the T10 meta in ranked this season is extremely harsh on destroyers, and you're going to find yourself relying on your teammates more than you'd probably like to while struggling mightily to save stars in the inevitable losses. Cruisers (Hindenburg in particular) are the consensus choice as "easiest" to rank out in this season. Knowing from what direction an enemy ship will come gives you a major advantage. You know from what direction possible torpedoes can come from, you can have your guns ready, you can be ready to kite, you can let your team know the area of the enemy ship and you know whether you should torp a smoke cloud or not. Also as you mentioned you can avoid fights. German torpedoes have in general a fast reload but low damage. By using their fast reload wisely you can cause floodings on enemy BBs. This will make IFHE even less interesting to use. So IMHO get RPF. My post was specifically for Z-52. You should be out of T8 in like 5 minutes. You can make anything work in T8 if you play with two brain cells. I ran PT for a while and didnt like it for most general purpose DDs. I just run under the assumption that everyone is going to shoot me and I seem to avoid more damage. PM helps keep my boat functioning longer too. I tried JOAT, I like it for a straight comp build for CB. 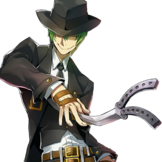 I run AR primarily because the 1v1 DD fights you occasionally have to get in to prevent a back cap. Ranked just doesnt have the communication and team work to always get someone to help you. BFT and AR give you the best chance in the fight. A DDs job is to scout not farm damage. If you are in open maps you are at an information disadvantage if your foe has RPF. IFHE is the absolute last useful skill I would run on most DDs. Its too expensive, and doesnt help you directly with your job of scouting and controlling caps. EL I could swap with PT, or drop AR for TAE. Unless you are playing the akiz, IFHE will only help you vs cruisers. at tier 8 all bbs have atleast 32mm+ of armor on the ship, minus the superstructure. which is 19mm. all destroyer HE with 127mm or larger can pen 21mm armor, with IFHE you can pen 27mm. What the IFHE does it helps you to pen cruisers more. Most cruisers at tier 8+ have 25mm+ of armor. 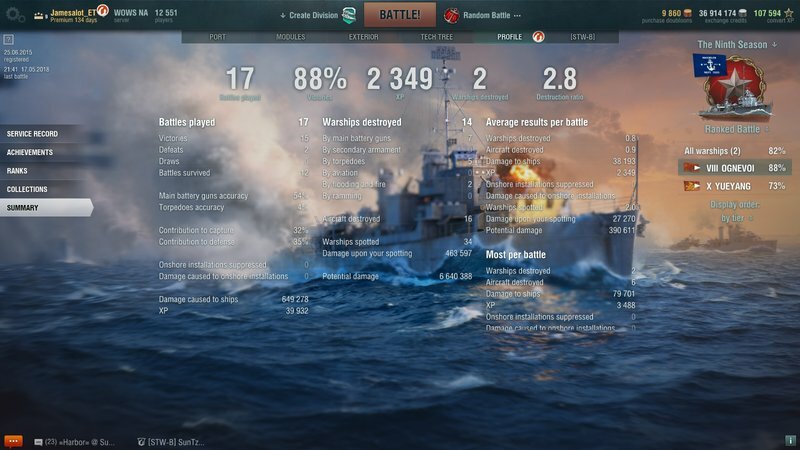 So where as the IFHE will let you deal more damage to cruisers it doesn't help you much if any vs BB's and DD's. 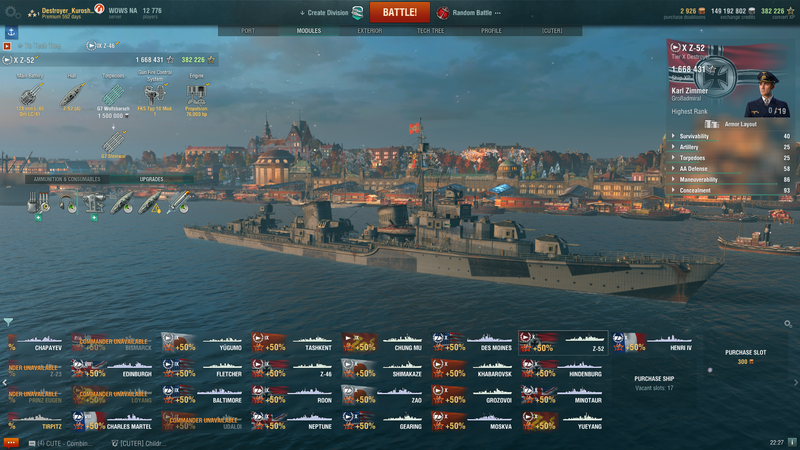 In either case as a german DD if a battleship(minus a german in a lot of cases) or cruiser goes broadside, you should 80% of the time go AP. 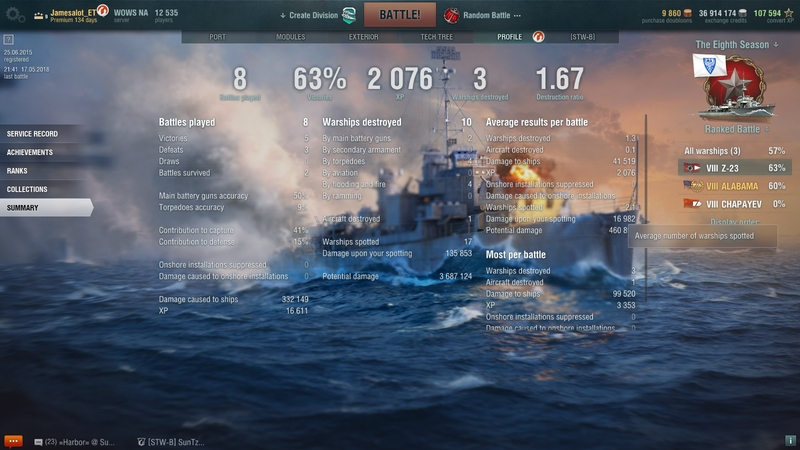 Most of the cruisers at tier 8 only have 100mm of citadel armor. I think new Orleans is strongest at 127mm but you can even pen that. so basically broadside target HE will get you about 1800 all 4 pens and may be a fire. 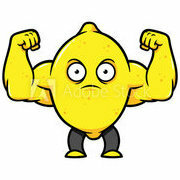 AP will get you 3,600 damage all 4 pen, or 5700 with 3 pens and 1 cit. fires are not guaranteed damage. its possible damage depending if they repair it or not. and if you have to shot 4 vollies with max damage of 1800 to get one fire that is going to give you 5k damage that is only 12,200 damage. compared to the ap of 14,400. these numbers of course is saying you get all 4 shells to hit the target and give a pen. Really? That changes things significantly. I was under the impression that I was gonna be playing the Z-23 with her 150s for some time. But if I'm gonna be in the tier ten ranks soon, and the lower ranks go that fast, I might have been overplanning for those ranks. In that case, ramping up the rate of fire on the Z-52 and getting as much info as I can is much more important. Thank you for setting me straight. Unless you are playing the akiz, IFHE will only help you vs cruisers. at tier 8 all bbs have atleast 32mm+ of armor on the ship, minus the superstructure. That's true in most cases, but I was specifically thinking of the Z-23 and Z-39, and both of them have 150mm guns. With IFHE, and assuming I did the math right (a dangerous thing to assume), they should get 33mm of penetration. Still a worthless skill for ranked, now that I've looked more into it, but fun if I'm goofing around in random. But thank you for the advice on AP. I've always had a hard time wrapping my head around when to use it in DDs, and your information was very helpful. Thank you. If you are thinking of doing damage in a DD, you are going to have a really hard time in Ranked. The small team size doesn't allow one to not do his job. And DD's jobs, at least the top ones, are spotting, capping, and staying alive. It's a hard life for DDs since if you do your job and still lose, you won't keep your star. But if your goal is to win, then the heck with the stars. Also, you can get past T8 to R10 in any ship as long it's the one you are most comfortable with. R10 up is a different story. The T10 meta is just too strong to work against fro most players. To clarify my clarification, there is nothing wrong with the 128mm option on Z-23. I dont know what rank you are, nor estimate your win rate. For me I was in ranked 10 on the first day with Kagero. I actually prefer the 128mm for more DD centric modes like ranked. The AP is just far more consistent than the 150mm AP. Z-23 isnt really good at fighting DDs solo, particularly Lo Yangs with their [edited] hydro. Proper AP usage is important to give you a jump start in the DPM war. Z-23 does have a fat chunk of hit points where if you can position yourself avoiding effective enemy supporting fire from CA and BBs you can tank DDs. You will be facing other DDs that likely have BFT and AR. Not running BFT means you need to out play them to make up that difference. If I were to play ranked today with Z-23 with 128mm I would run BFT and AR and play as a hybrid DD. If I was running the 150mm I would run TAE and AR and play more of a torp boat. My concern with this build is typical torp boat play styles involve using your concealment ranges to zone out other DDs from the cap. That is impossible for Z-23. In my opinion the 150mm is better for harassing larger ships with DOTs than fighting DDs. You are probably more dependent on the smoke hydro combo than the 128mm. My point of caution is to never smoke when you might be radared or hydroed when the enemy team can shoot you. You take too much burst damage to permit that. My suggestion is to go into the training room and lot a bunch of inactive bots in the DDs you are likely to face, then shoot the crapout of them broadside. See where on the ships will give you pen damage more consistently. Load a fresh round of bots and work on your max angles for your AP. My advice is there are areas that even when DDs are pretty angled offer a flat enough surface for good AP pens. The curved section of the bows is a really common one, but the stern of Yue Yang with its slight odd angles offers a small but good hit box that can net 3k volleys. See what works for you. Then load a third room and shoot them with HE. Once you are out compare the numbers for the different ships engaged with the different ammo types to find which is in general going to perform best for you. For example, narrow IJN DD tend to get over penned the most, particularly broadside, but with a slight angle or landing their bow AP is king. If I havent played German DDs in a while I will also load a training room up for target practice to refresh my aim. There is a lot of home work that goes into using the German guns to their maximum efficiency. They are rewarding once you figure them out. Look for my threads on Z-52 and Z-39, I have a few replays up that might help you further. Yes actually if your running the 150's IFHE will make a big difference on getting pen damage on more of the ship. do keep in mind that you lose 3% chance of fire with the 150mm using IFHE. In most cases though using the 150mm you are not looking for that raw damage. but setting fires. since its 12% base fire chance. with flags and demo expert if you decide to run that. you will have 15% chance. with the 150mm in general if your shotting a cruiser broadside aim for the cit. you can cit a cruiser from max range with the 150's no problem, using ap. But a good strategy when using the 150mm. is ambush. flank the enemy team using torps to control the battle. but when a cruiser gives you a full broadside shot 1 volley of ap. and then disappear. a good volley will net you between 5-10k damage. you want to basically hit and run. that one volley will get the enemy to turn their guns to you. in most cases since you are only shotting 1. you will disappear before they see you. basically you are looking for burst damage harrashment. where as a kiev is looking for contant harrashment. Russian dd pisses people off by constantly setting them on fire and dealing damage over time, german dd with 150mm are looking for burst damage. that burst damage + torps will make the enemy angle towards you giving their broadside to your team. Russian dd is looking to make the enemy shoot at them so they don't shot at his allies. I think I explained this. let me know if you don't understand something I said.